Can a fleet of power-assisted bicycles help jump start Baltimore’s economy by providing a lift to homeless and hurting veterans? Good paying jobs, and pleasant rides, are two of the goals behind the soon-to-be-launched Baltimore Bike Share Program. Reporters had an opportunity to try out some of the state of the art bikes that will be available for short-term rent around Baltimore beginning Fall 2016. The demonstration took place earlier today at The Baltimore Station, 140 W. West Street, in the Otterbien section of Baltimore. 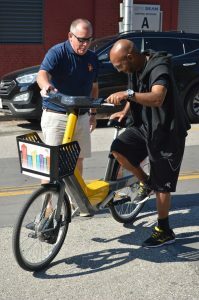 The Baltimore Bike Share Program will be similar to rental programs found in many other metropolitan areas, though officials here say the number of pedal-assisted bicycles in Baltimore City’s program will be the largest of any program in North and South America. 500 bicycles will be available for short-term rent around Baltimore, thanks to the approval of a $2.36 million contract with Canadian company Bewegen Technologies. 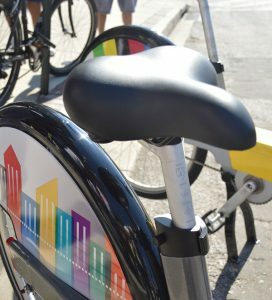 The bicycles, 200 of them featuring electric-assisted pedaling, will be placed at 50 stations around town, in an area spanning from the Inner Harbor west to Union Square, north to Charles North, east to Canton and south to Locust Point. Riders will be responsible for providing their own helmet. Each bicycle will be equipped with GPS technology to track its whereabouts. Bewegen Technologies, and program partner Corps Logistics, plan to hire about 80 local employees, including veterans at The Baltimore Station – a transitional residential treatment program for men recovering from homelessness and drug addiction. 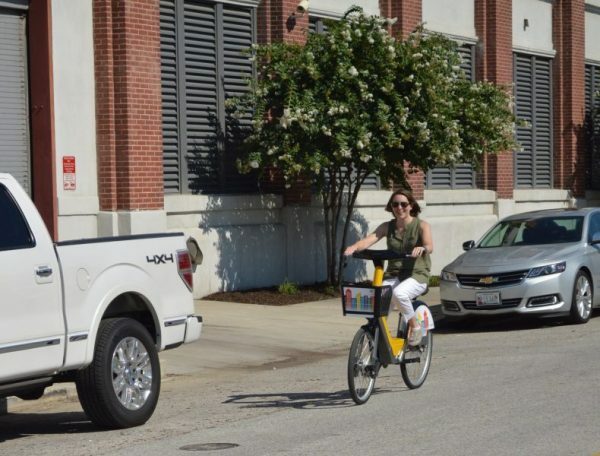 Jim Duffney, CEO of Corps Logistics, told the Baltimore Post-Examiner the power-assisted bikes are known generically as pedelec bikes (from pedal electric cycle). Duffney said the cost of the bicycles vary, but he wasn’t sure what the city paid for them. Duffney did, however, confirm that the rentals would be available on both a daily and monthly use plan. “I like to say renting these bikes is like taking a bus, but instead of traveling on their time, you travel on yours. It’s a very safe design, the seat height can be easily adjusted to fit the rider. The front wheel is smaller than the back, so it gives you a bit more ease in turning. Taking a quick spin, this reporter was immediately impressed with the ease of the ride. The Bewegen power-assisted bikes look and feel just like the public access bikes one will find in New York or Washington, DC. Your posture is upright, with good visibility. The “wow” moment comes when you begin to pedal and feel the silent electric motor start up. The bike moves along crisply, effecting a ride that is energetic without being too taxing. 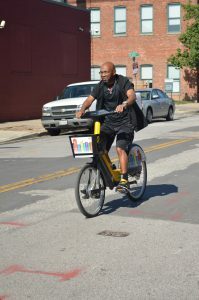 Time limitations precluded any opportunity to test the bike in some of Baltimore’s more topographically challenging areas. Even so, those we spoke with thoroughly enjoyed their rides and appeared to be anxious for more. We asked Robinson if he was a regular bicycle rider? New Jersey native James Damico was also impressed with his demonstration ride. Could Damico see himself using the bike on a future visit to Baltimore? Seat height can be easily adjusted to fit the rider. William Miller, one of the facility residents, certainly enjoyed his ride. A Vietnam-era veteran who now uses a wheelchair, Miller smiled as he watched other residents take a spin from a shady spot near the entry door. “That was amazing,” exclaimed Jim Duffney, shortly after William Miller’s ride. “He was in a wheelchair, and we helped him get on the bike and he rode it. He couldn’t even believe that he could still ride a bike. So what this bike does is it opens the demographic up to many different riders. And what does that do? People who can get on this bike and ride it will say, ‘Hey – I can do this. I will get my own bike now.’ It’s great. For more information please visit Baltimore Bike Share.